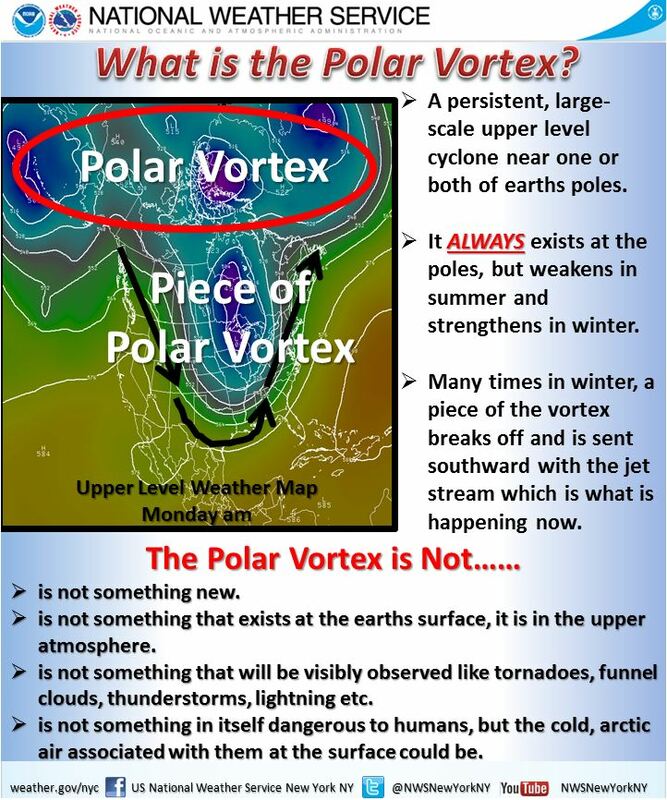 My Thoughts on The Past Week: Polar Vortex…Ion? It’s been a while since I’ve written, but the last week in the meteorological enterprise was a blur of “Polar Vortex,” frozen Chicago posts, boiling water turning to snow videos, and the freezing of a half-dozen different fruits and vegetables. At times, the hashtag #PolarVortex was even trending above #FSU and #Auburn during the BCS National Championship…a personal jab in the side for a FSU meteorologist. I am not going to explain the phenomena that happened last week since it happens all the time, but instead I’ll point you toward a post NWS New York (below) made three days ago about the phenomenon that has become more phenomenal that need be. After all, it’s been in the glossary of the AMS for more than 50 years. Now, what I will comment on is the practice of naming winter systems. Known to most by now, the Weather Channel has been naming winter storms for a year and a half. The idea behind naming weather systems has been around, in terms of a government function, for 60 years. As anyone on the street in Miami if they remember Andrew, and they won’t be talking about their cousin or father. The same goes for Katrina, Wilma, and Camille….all of which were monstrous storms. The same also goes for Zeta…a storm that affected few, but that name makes it recognizable. The goal of TWC’s naming of storms was to get a collective name behind a certain storm, and that I support. Before their practice, the social mediasphere were coming up with names like snowmaggedon and snowpocalypse. Attach a few letters after snow, and you had a storm. What I don’t support is the naming of a system with no criteria. The naming of tropical cyclones worldwide is done with meticulous criteria set forth by a number of well thought out organizations. In a quick google search, I was still unable to find any hard and fast requirements for naming a winter storm. With mention that the shape, size, precipitation type, and temperature regimes are much more variant than in tropical cyclones, I still believe that the practice of naming winter storms should be much more scientific in the meteorological sense. In fact, I believe criteria should be developed over the next decade with help from both meteorologists and social scientists. To go one step further, I would suggest that the Weather Prediction Center pick up the naming practice in a decade. Now, the question is whether or not the practice was successful with this recent storm. By far, twitter activity seemed to weigh heavily toward the term “Polar Vortex” rather than the TWC’s name of “Ion”. I have to wonder if this storm has been named Hercules, the previous name on the list (used a week ago), would have garnered more attention from the 1950’s glossary term of the AMS phenomena. In other words, if scientists created a new list of names for winter storms, would the public use it? The effects of this storm were the same with or without a name. To those of you in the Midwest: I hope warmth, power, and the sight of a less snowy front yard returns soon. I couldn’t imagine what you all went through earlier this week.